Are you HIV positive and newly diagnosed with hepatitis C (Hep C)? Do you have one virus and think you might be infected with the other? If so, this brochure answers some basic questions about living with both HIV and Hep C.
What is HIV and Hep C co-infection? When people have HIV and another major infection such as Hep C, they are co-infected. HIV is a virus that attacks the immune system, killing the CD4+ cells that help the body fight off infection. Hep C is a virus that attacks the liver, and can cause liver damage (cirrhosis), liver failure and liver cancer. 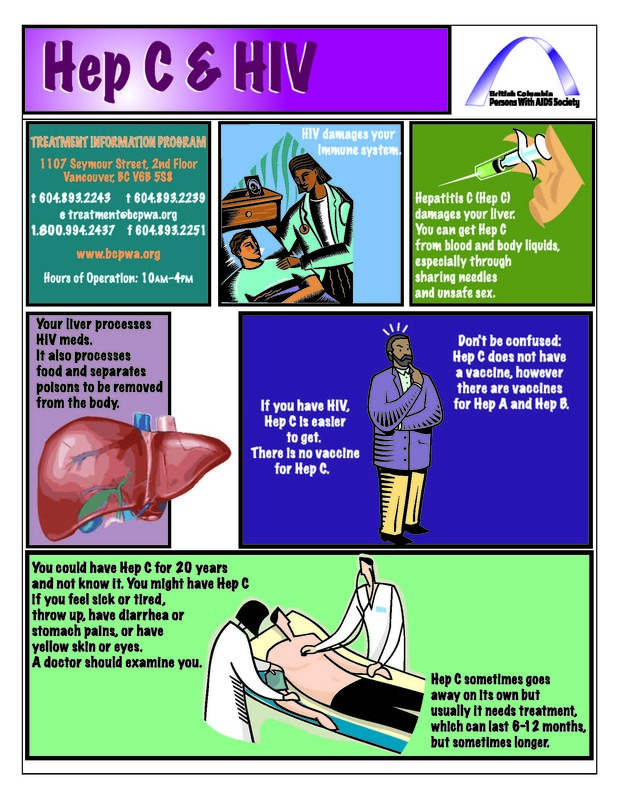 You might also hear the Hep C virus referred to as HCV. How do I know if I’m co-infected? If you have either HIV or Hep C, you are at risk for also having the other virus because both can enter your body the same way. The only way to find out for sure if you are infected with HIV and Hep C is by being tested. Each virus is detected by a different test, so you need both an HIV test and a Hep C test. You might be co-infected and not know it. Both are slow acting viruses. People can be infected for years with either virus without having any signs or symptoms of illness. Why is HIV and Hep C co-infection a problem? Being infected with both HIV and Hep C is a problem because each one is very hard on your body. When you are co-infected, each disease makes the other one worse. You can get sicker faster, and it is hard to treat both diseases at the same time. HIV can cause the Hep C virus to reproduce more quickly. People who are co-infected can develop liver damage and liver cancer more quickly than people who have only Hep C. Having HIV makes Hep C harder to treat because the immune system is weaker. Having Hep C also makes HIV harder to treat. Many of the medications used to treat HIV are processed by the liver. A liver badly damaged by Hep C cannot process drugs as well. Although generally safe, the risk of side effects with HIV medications may be slightly higher. Some doctors start their patients on medications to minimize the risk of depression a month before starting Hep C therapy. If you are using substances, you may want to talk to your doctor or nurse about how to quit drinking alcohol or get help for dependence on street drugs. These changes will make it easier to take treatment. Because of side effects, some people are tempted to stop their Hep C treatment. But for the treatment to prescribed. If you experience bad side effects, you should talk to your doctor or nurse about ways to prevent or reduce them. The complete brochure can be found here: click! This entry was posted in English and tagged Hepatitis, HIV, HIV and Hepatitis C Co-Infection by kiumars. Bookmark the permalink.